avec une monture Nikon F). marquer différemment ces boîtiers destinés à ce marché ... et rebaptisa les NIKON ... en NIKKOR .d’où toute une gamme de NIKON F et accessoires (moteurs, viseurs, dos, etc ...), qui sont eux aussi très prisés par les collectionneurs du monde entier. (pour Junior ..peut être). Certainement le plus RARE de tous les Nikon.... Seule la version Chromée était connue...mais tout d’un coup un NOIR est apparu, suivi d’un second (vendu chez Tamarkin) dont le numéro de série est très proche du mien. 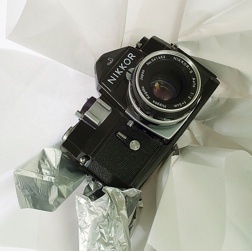 Bien que le spécialiste des “NIKKOR F” (notre ami Uli KOCH) doute de son authenticité, je ne vois pas bien comment aurait pu être fabriqué un “faux” ... alors que même le Chrome est introuvable ... De plus là ou la peinture est frottée, on ne trouve pas de chrome, mais la base typique des boitiers noirs. Combien sont sortis des chaînes ??? Nul ne le saura peut être jamais (comme le nombre de Nikkor J Chromé d’ailleurs). In 1962, Nikon introduced a new model of economical camera: the NIKKOREX F (produced by Mamiya, under license with an F mount). These light cameras, were quickly dropped , as soon as the NIKKORMAT serie showed up, but was first worlwide sold, and is pretty easy to spot on the secondhand market. Except for the “black” version, made on special order only for the Norvegian Army, which made it rapidly one of the most sought after model for collectors of Nikon cameras worldwide. and renamed the NIKON... in NIKKOR, so a great variety of NIKON F bodies, finders, motors and accessories were manufactured and are very sought after by serious Nikon collectors worldwide. Not willing to confuse the public with an other name (NIKKOREX ...), they also renamed them in NIKKOR, but instead of “F” they named them “J” (maybe for “JUNIOR”). Certainly the rarest of all Nikon... Only the Chrome version was known, but suddenly a BLACK model appeared, followed by a second one (sold at TAMARKIN), whose serial number is very closed to mine. is doubting it is a true model, but honestly , how could somebody make a “fake” black (repainted .. ), when you know that the original chrome is so rare ... Added to that, when you check the paint where it is worn out, you see the typical base of black bodies, and not a chrome finish. How many “Black NIKKOR J” have ever been made? ?